Turnitin may be used to check the originality of student work and to detect for possible plagiarism. Courseware Support is available to consult on how to set up Turnitin to meet specific assignment needs. If you need help, please email canvas@pobox.upenn.edu. Assignments that require originality checking must be configured to use Turnitin before students begin submitting assignments. It is not possible to retroactively check student that has already been submitted. Please read Turnitin’s End User License Agreement (EULA), Turnitin Guidelines, and Responding to Plagiarism before using Turnitin. Turnitin cannot be used with quizzes or discussions. Using Turnitin with Canvas Plagiarism Framework preserves the ability to bulk download student submissions in Canvas, to use groups assignments, and to view Canvas Rubrics. Faculty and Instructors who use Turnitin should be aware that the product is subject to an End User License Agreement (EULA). Teaching team members will need to agree to this EULA before accessing a Turnitin originality report for the first time, and students will need to agree to it each time they submit (or resubmit) work to a Turnitin-enabled assignment. More information on Turnitin’s EULA. Please share information about Turnitin’s EULA with your students through your course syllabus or as part of the information you provide with an individual assignment. If you have and questions or would like further information, please contact the Courseware Support Team at canvas@pobox.upenn.edu. Turnitin must be enabled for a Canvas assignment before students begin uploading their submissions. Though you can enable originality checking through Turnitin at any time, submissions made prior to enabling this feature will NOT be checked retroactively. To create a Turnitin-enabled assignment, go to the Assignments Index page and select +Assignment. Specify the assignment name, description, due date, and points. Under Submission Type, select Online Submission, and then specify Text Entry and/or File Uploads. If you select File Uploads, you may also specify which types of files students can upload. 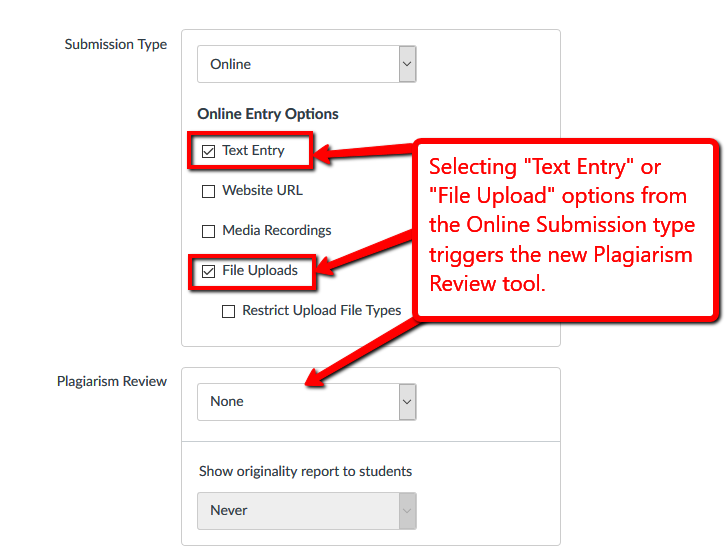 Plagiarism Review options appear when you select Text Entry or File Uploads. Select Turnitin from the Plagiarism Review tool to enable originality checking for this assignment. This will open the Turnitin menu. Adjust the Turnitin settings as appropriate. Default settings will store student submissions in a Penn-specific repository and will not show originality reports to students. Teaching team members can specify whether to save student submissions in Penn’s repository, what to compare student work against, what to exclude from the similarity report, and whether to show originality reports to students. In most cases, Turnitin-enabled assignments using the Canvas Plagiarism Framework will be the preferred integration to use. So many teaching teams may benefit from changing existing Turnitin LTI assignments into assignments using CPF. Go to Assignments Index page and select the name of the existing Turnitin LTI assignment you want to change, and then select Edit Assignment Settings. When you specify Text Entry and/or File Uploads, the Plagiarism Review options appear. 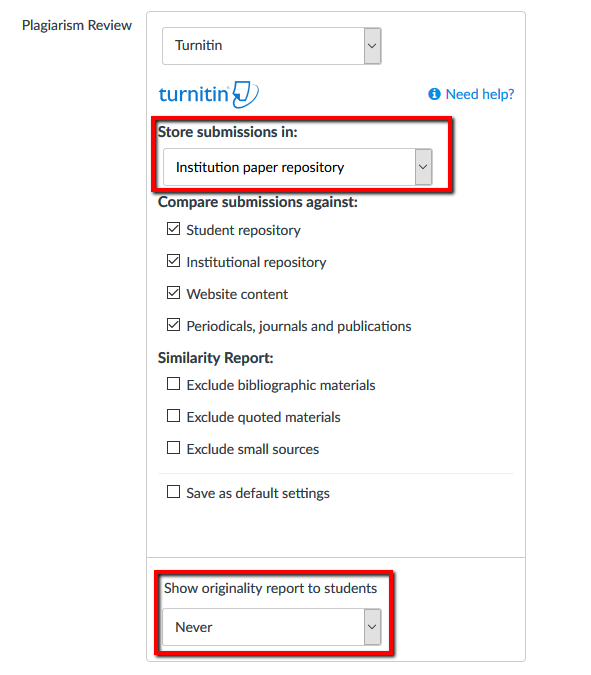 Follow the instructions for Creating a Turnitin-Enabled Assignment, starting with step 4. From within Canvas you can view originality scores or access the full originality reports. Gradebook shows a color-coded icon indicating the compatibility score similarity range. Clicking on the icon will display the similarity score and allow you to access the originality report. SpeedGrader displays the similarity score next to the submission details. Clicking on the icon launches the complete report on Turnitin’s website.